Transparency Market Research has published a new report titled “Photoresists and Photoresist Ancillaries Market - Global Industry Analysis, Size, Share, Growth, Trends and Forecast, 2014 - 2020.” According to the report, the global photoresists and photoresist ancillaries market was valued at US$ 3.02 Bn in 2013 and is anticipated to reach US$ 4.60 Bn by 2020, expanding at a CAGR of 6.2% between 2014 and 2020. Growth in the global semiconductor industry is anticipated to drive the photoresists and photoresist ancillaries market worldwide. Photoresists are indispensable components in the process of multi-layer wiring configuration in semiconductor manufacturing and high density packaging. Trends in dynamic display technologies are estimated to boost the photoresists and photoresist ancillaries market in the near future. However, environmental and occupational health hazards associated with photoresists and photoresist ancillaries are projected to hamper market growth. Upcoming nanoelectromechanical systems (NEMS) are likely to offer high opportunities for market players in the next few years. ArF immersion photoresists emerged as the largest application of the global photoresists market share in 2013. Increasing trend of miniaturization and semiconductor downsizing in the global electronics industry is projected to drive the segment during the forecast period. Antireflective coatings held the largest share of the global photoresists ancillaries market and accounted for over 30% of the share in 2013. Resolution enhancement offered by antireflective coatings is expected to drive the segment in the next few years. In terms of revenue, semiconductor and ICs application segment that held the largest share is anticipated to expand at a CAGR of over 6% between 2014 and 2020. Photoresists and ancillaries are used in semiconductor fabrication and packaging. Printed circuit board was the second-largest application segment in the global photoresists and photoresist ancillaries market in 2013. Asia Pacific dominated the global photoresists and photoresist ancillaries market, accounting for more than 65% in 2013, led by high demand from semiconductor and printed circuit boards industries. Asia Pacific is considered the manufacturing hub for the global electronics industry. In terms of revenue, the market in North America is anticipated grow at a moderate rate due to recovery of semiconductor industry in the region. The market for photoresists and photoresist ancillaries in RoW is projected to expand at the second-highest growth rate in the next few years, due to growth in consumer electronics industry in the region. 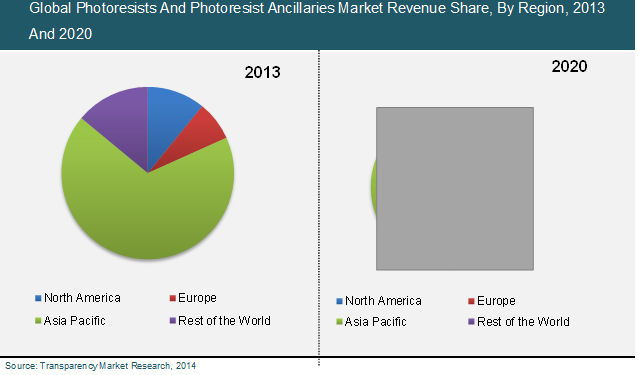 The global photoresists market was highly consolidated, with the top three players accounting for over 60% share in 2013. Key industry participants include JSR Corporation, The Dow Chemical Company, TOKYO OHKA KOGYO CO., LTD., Avantor Performance Materials Inc., Merck KGaA and FUJIFILM Electronic Materials Co. Ltd.